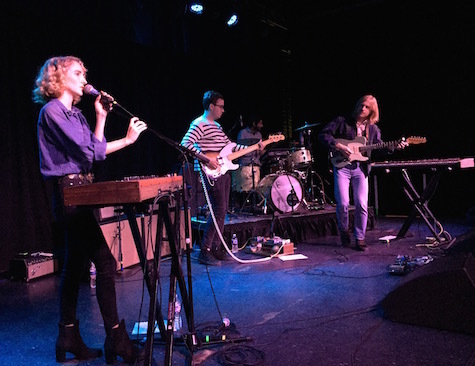 Tennis at The Waiting Room, Nov. 5, 2014. The band returns to tonight. One of Hear Nebraska’s last forays into music journalism (for now, anyway) was a video interview with Digital Leather’s Shawn Foree about his just-released LP Pink Thunder. Read it here. It’s a straight-up interview by HN’s Lauren Farris, and when I look back at what HN did in terms of music reporting, this was the kind of stuff I liked best. Because there simply isn’t anyone interviewing local bands anymore in a way that HN approached these interviews — in depth, professional, with the writer staying out of the copy and out of the frame. It makes me miss what I used to do at The Reader back when it was a weekly and I was hustling an interview a week (plus a column). HN’s recent departure brings up the question of music journalism’s relevance to the general local music audience. I personally think it’s important; that it still needs to be done. We just need to find a place to do it (in addition to in ol’ Lazy-i). Wouldn’t it be awesome if someone started a music weekly with interviews, album reviews, live reviews, photos and a gig calendar?? I’d subscribe. Anyway, I finally got my chance to interview Foree a couple years ago when Digital Leather released All Faded. He’s an interesting dude and one of the most talented musicians and songwriters in Nebraska. It’s appropriate that HN went out by interviewing him. Check it out and check out Pink Thunder, which you can order online here and, I believe, is available in its vinyl incarnation at Almost Music. At The Waiting Room it’s the return of Tennis, who just played here this past summer when they headlined Farnam Fest. New York electro-pop duo Overcoats (Arts & Crafts Records) opens at 8 p.m. $18. Also tonight, Pageturners’ Winter Concert Series continues with Nathan Ma and the Psychic Readers. This one is free and starts at 9 p.m.